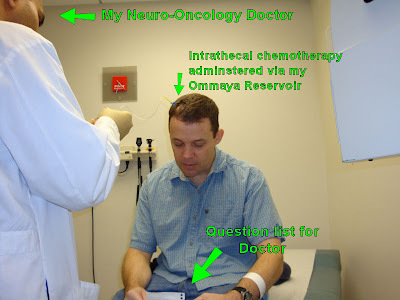 My CSF withdrawn during Intrathecal Chemo #4 was checked for cancerous cells, and none were found again. I'm hoping my results will be that positive for six more treatments... For some levity, The picture below was sent to me by my friend Deane this (2/10) morning. My blood counts were also checked today. My WBCs (for fending off infections and sickness), Neutrophils (like WBCs), and hemoglobin counts (oxygen delivery, energy, cell development (cell development-I kind off made that up/I mean didn't confirm it) were all down. And my platelets (clotting) were slightly up. My platelets have been the slowest count to recover. They're all under the normal low value, as can be seen on my extreme right-hand side of my blood count plot. Once again, I hope to post within the next month, unlike the last one... For one thing, I want to put a link up to a glossary of medical terms when I get a chance. In the meantime, I've found Wikipedia to be a good reference for other subjects.